After last week’s post about a big reason WHY you should use an ad blocker when you visit websites, I got several inquiries asking, “What ad blocker should I use? Where do I find it? How do I get it on my computer?”. So this week we’ll talk about a couple of the popular ones, including the one I use on my own primary computer. 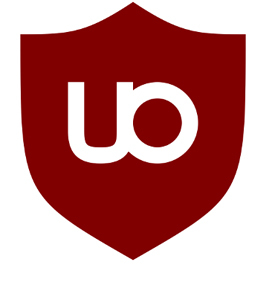 uBlock Origin is the one I have been using for quite some time. It does a great job keeping the ads from popping up on the various websites I visit. But when I click on one of them, uBlock alerts me that I just clicked on an advertisement and shows the following options. I usually just click on “Temporarily” so I can go through and see the website. But if I wanted to just always allow ads from Google searches such as this, I could click on “Permanently” and the ads would take me straight to the website. Or I can just click “Go back”. 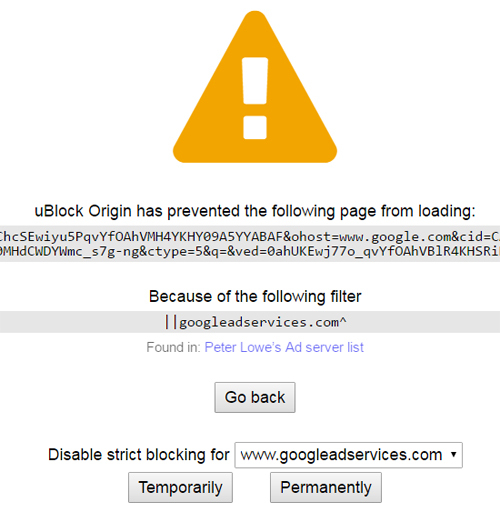 AdBlock Plus is an ad blocking program that has been around for a long time. In fact, it may have been the first ad blocker available. It also works well. One thing to keep in mind with this one though – you might notice that the tag line does not say “surf the web without ads”. No, instead it says “Surf the web without annoying ads”. This might seem like an insignificant distinction, but it does have meaning. AdBlock Plus, by default, lets SOME ads be displayed – the “nice” ones. If an ad has obnoxious blinking text or it’s jumping around on the page or it’s otherwise too distracting, it will be blocked. So you will see a few ads still, unless you go into the configuration and tell it, “No, I don’t want to see ANY ads”. At least they do give you that option. The one you end up using would just be a personal preference. You might want to try one of them for a week, then remove it and put the other one on for a week. No matter which one you use, your web experience will be much more enjoyable (and safe) with most or all of the ads not displaying.